This is the fourth post in a series of basic preschool skills posts. So far I’ve outlined key information about preschool milestones and goals for teaching about preschool reading and preschool math. Now we’ll take a look at preschool science skills. I personally find science incredibly fun to teach. Preschoolers are so naturally curious that any topic can lead us into a full unit of study and amazing discoveries. Preschool science can be divided into four main areas: science processes, life science, physical science, and earth and space science. As I’ve said in the previous preschool basics posts, please know that this is just an overview. If you have specific questions or need additional information, please head over to the Home Preschool Help Facebook Group and we’ll be glad to help! In this section we’ll provide a brief introduction to preschool science skills and the goals of early science instruction. 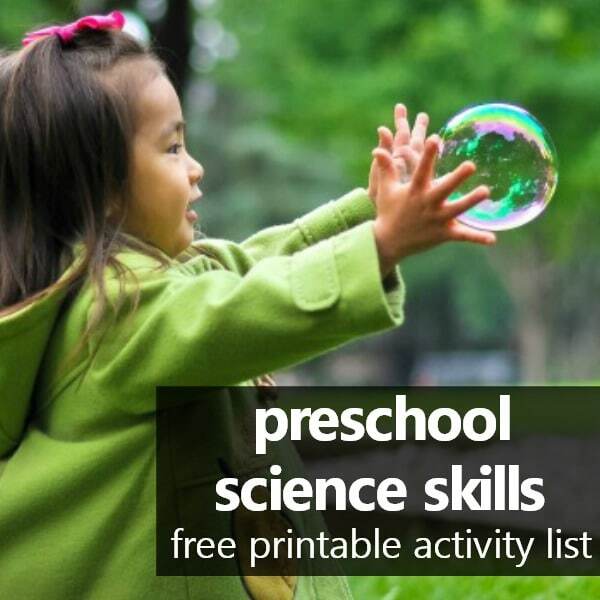 There’s also a free printable list of preschool science skills and easy activities for each of the main aspects of science, so you can try some fun science activities together right away. Preschool science instruction is less about learning a specific body of knowledge and more about developing a way of thinking and exploring. In my opinion it doesn’t matter whether you learn about butterflies vs. ladybugs or rocks vs. stars, preschool science should teach students that all sorts of things can be examined and learned from. I personally like to develop units around topics my kids show an interest in, so we might spend a week or two learning all we can about rocks as a main theme. Not only will we do science activities, we’ll include interdisciplinary activities that help us work on math and literacy goals as well. This may not be the path you choose to take in your home preschool routine, but it is a possibility to consider if it intrigues you. We’ve outlined resources for many of our favorite preschool themes on our theme directory page. 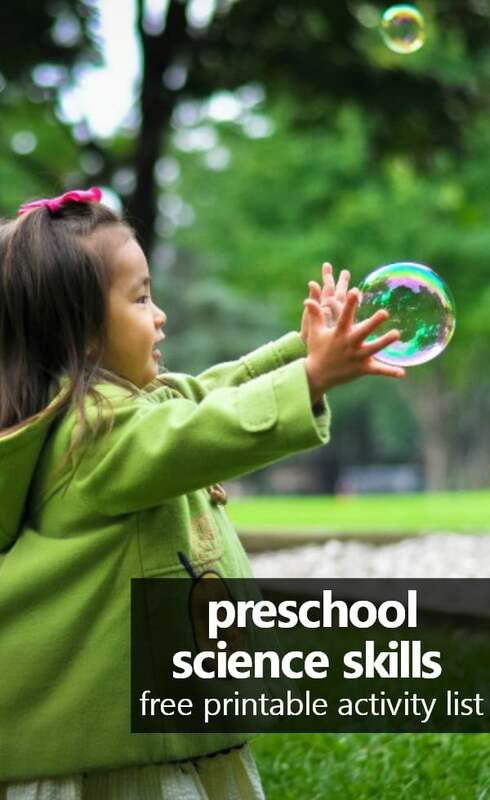 It’s a great resource to refer back to as you plan for home preschool, and we weave science into every theme. You can also find tons of science inspiration in the science activities section of our website. However, we also wanted to make it very easy for you to integrate science activities into your routine, so we’ve outlined the key science areas and some low-prep science activities that you can do to help teach them. In the free printable below you’ll find a list of science activities that can be done with toys and materials you have at home. Take a look at the science goals you’ve selected for your child. Review the activities in the Toolbox and select a few to use during your first weeks of home preschool. Jot down any additional ideas you have for teaching those science skills. This is Unit 2, Lesson 4 of the Guide to Getting Started with Home Preschool. Return to the main Guide page or proceed to Unit 2, Lesson 5: Additional Preschool Concepts.